This week, along with 20 other team members, he plans to travel to Melbourne for the 2014 Australian Transplant Games, competing in swimming. The 49-year-old began to have liver pains at the age of 21. It developed into a form of hepatitis, which could not be cured with medication. ‘I am alive today because of donated organs and the medical system being able to do the surgery,’ Turner said. Run over eight days from September 26 to October 24, the Games are held every two years, offering more than 21 competitive sports and 10 special events. 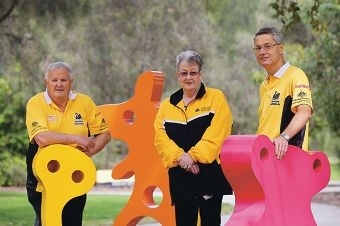 Turner, who competed in 2008, said recipients took part in memory of the wonderful Australians who made the charitable gift. ‘I am not a particularly good sports person, I don’t really want to achieve a lot, the games are there to raise awareness and to encourage us to keep a good level of fitness,’ Turner said.